Deadpool delivered on the “big, pink surprise” he promised Tuesday night and unintentionally cosplayed as one of the weirdest characters in Marvel Comics history: Gwenpool. During the first-ever airing of the Deadpool movie on FX Tuesday night, Ryan Reynolds showed up to announce an Omaze contest that’ll fight cancer by taking your money and raffling off the pink Deadpool costume right off his back. It’s fitting that Deadpool, a fictional superhero stricken with cancer that’s fond of breaking the fourth wall, would show up in a pink costume to do something about cancer here in the real world. “This is one fight where everyone can be a superhero,” Deadpool says in the video. “No superpowers, capes, or lame CG costumes needed — just your money. Seriously, we need that. These suits aren’t cheap.” Deadpool in pink also resonates with his female counterpart Gwenpool, a character whose only abilities come from an extensive knowledge of the Marvel universe and her capacity to break the fourth wall more often than Deadpool himself. Gwenpool appearing on the cover of her final issue, "The Unbelievable Gwenpool #25." In Marvel Comics, Gwenpool is an amalgam of Gwen Stacy and Deadpool who first appeared on a variant cover of Deadpool’s Secret Secret Wars #2. Keep in mind that Deadpool (real name Wade Wilson) was originally created as an exaggerated version of DC Comics’ Slade Wilson, aka Deathstroke. 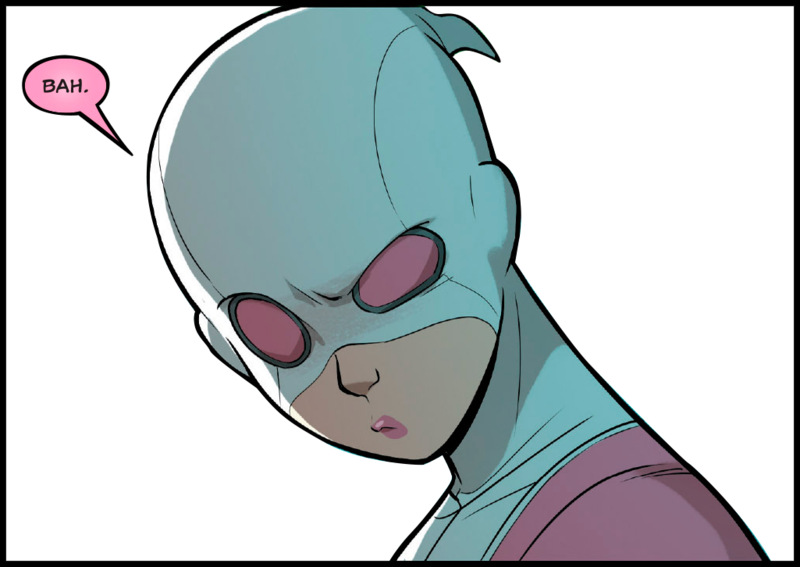 So in a hysterically convoluted way, Gwenpool is perhaps more Deadpool than Deadpool himself, going one step further to analyze comic book tropes to help her survive and defeat enemies far more powerful than her. Sadly, Gwenpool’s comic book arc ended in late February with The Unbelievable Gwenpool #25, but considering the nature of comics, she’s bound to get some kind of “all-new” story arc at some point. To be fair, the costume Deadpool wears in the new video is literally just the costume from the movie with all the red leather replaced with bright pink. So it’s not technically a Gwenpool cosplay, but you can’t deny how similar the costume looks. If only the black leather pieces were white instead. You can send a “Big F-You to Cancer” by paying $10 or more to enter the contest on the official page. Deadpool 2 also hits theaters on May 18 with Deadpool’s traditional red costume.